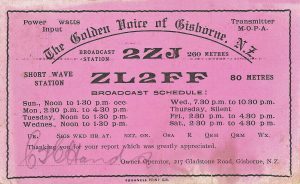 ← Some early “Insights” into Dunedin’s “B” Stations. Frank Barnett left school at 12 years of age to work with his father (also named Frank) who owned a bike shop in South Dunedin. 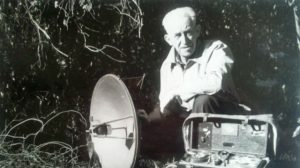 When Prof Jack started broadcasting from the University of Otago he took a keen interest and started building crystal sets for himself and for others and his father decided that radio was the future and sold the bike shop and set up a radio business. 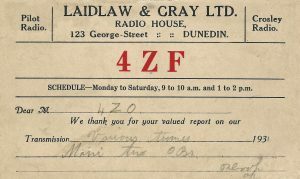 As radio was in its infancy in Dunedin they decided to have their own broadcast station to promote radio and of course their own business at the same time. Frank was then given the task of building the equipment required including the transmitter. Business was very good and they moved into the city centre and sold lots of receivers mainly “Majestic” which they held the agency for. These Majestic receivers were manufactured by “Grimsby Grunow” of Chicago, U.S.A. 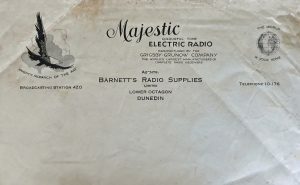 Majestic used Frank’s achievements with their radios in their advertisements. Above top is a Majestic advertisement depicting Frank tuning a Majestic receiver. Below we have the very same cabinet but with a more modern chassis fitted to make the most of this attractive cabinet as the original chassis was damaged beyond repair. Unfortunately the depression came along and as they had many sets sold on hire purchase, the business suffered from cash flow problems and the final straw was the govt closing down the private stations as it introduced the ZB stations. Frank then went to work for the NZBS and worked his way up to become chief technician in charge of maintenance for 4YA, 4ZB and 4YC. 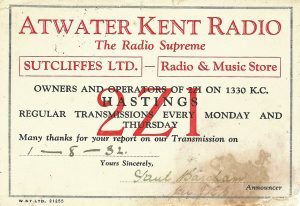 This was great achievement for a boy who left school at twelve and built his first transmitter at 21 (1927/28). 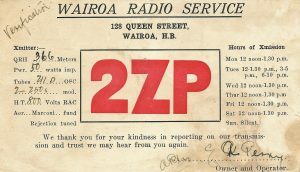 This transmitter and associated equipment was installed at “2 The Octagon”, Dunedin in the premises of Barnett’s Radio Supplies, where it broadcast from 1928 to 1937. In 1937 the station was purchased and closed by the Govt. 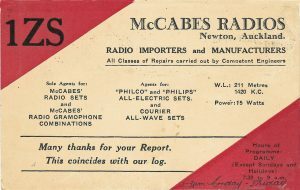 of the day and it was then used by 4XD as their transmitter and then as a standby unit and last used in that role in 1956. 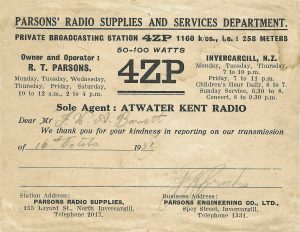 This transmitter is now back in Bruce’s possession and is very likely to become a display item at the “Awarua Radio Museum” near Invercargill in the near future. Little is known of his early DX days as most of this occurred before Bruce was born. 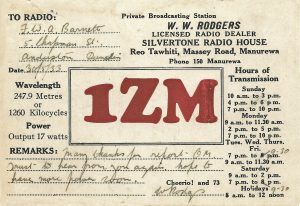 It is understood from material of the “Radio Record” that he started DXing about 1930. 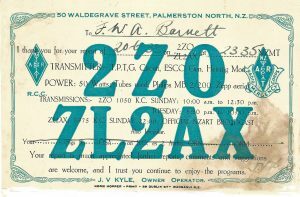 He was obviously a member of the Otago branch of the NZ DX club in 1932 as it is known that his membership number at that time was DX76, OC. With such a low membership number he was either one of the foundation members of this club or very close to being so. 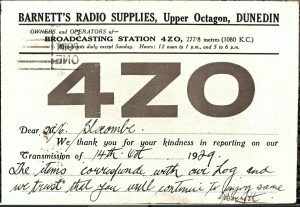 Frank was a very competitive man in every one of his endeavours including DXing and always strove to have the best verifications or tallies. 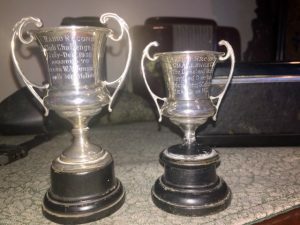 Below are images of 2 miniatures of his winning cups from 1932. 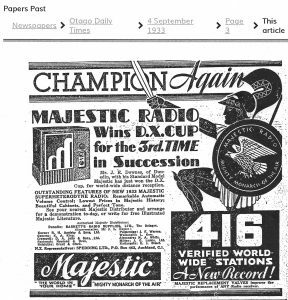 The “Radio Record” who first sponsored these DX trophies in 1930 kept the trophies in their possession but supplied the winners with miniatures. In addition to receiving a miniature the winners were presented with a handsome certificate. The trophies were awarded to Frank for the Jan – Jun 1932 period with 291 overseas stations verified and secondly for the Jul – Dec 1932 with 366 overseas stations verified. (657 MW veries in 1 year). 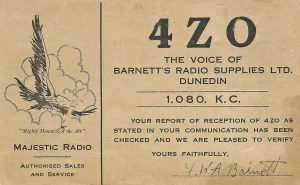 The “Radio Record” in 1932 describes his DX location as; on a rise about 1000 feet above sea level, about 10 miles air-line from Dunedin and one mile from the coast. This same article describes his receiver as a 7 valve standard a.c. superhetrodyne and most likely a “Majestic” and his main aerial as a beverage. 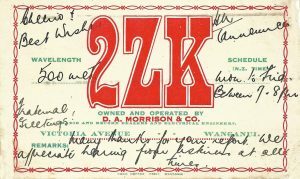 He was a member of the Dunedin branch of the NZDXRA at least during the 1930’s with a membership number of RA1192. It is unclear if he was a member of both clubs at the same time. In the late 1940’s it is known that he had a 1 room shack at Aramoana near Dunedin. This shack was built by Frank with the help of 2 fellow DXers. One of these fellows DXers was a Mr. Bain. This was most likely a Mr. J. Bain an unidentified Dunedin member of the NZDXRA. The other DXer was Mr. Jack E. Downes (an unknown DXer to the scriber). Frank had several aerials erected at Aramoana but by far the best of them all was a terminated beverage aerial that extended out into the sand dunes for several hundred feet towards North America. He used “Majestic” receivers for most of his DX. 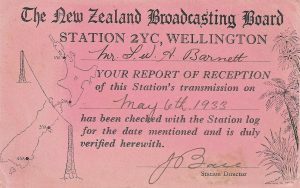 Below are some NZ Station DX cards from the 1930’s. This is Frank in the 1950’s with his “Bird Song” recording gear. He had imported a war surplus parabolic dish from the States and had lighter Fibre Glass ones made using it as a mould. The recorder was an EMI L2B weighing about 26 lbs. Many of his recordings were used on New Zealand “YA” stations as their 9 am bird call. 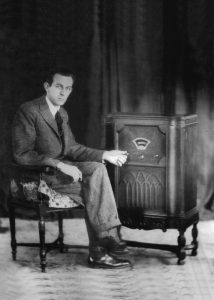 Some 100 Watt North American Verifications from the 1930&#8217;s.
Thanks for your story about Frank Barnett. I have in my collection a Majestic model 331 from 1932/33. It has similar fretwork to the one in your photograph but is a table model. It required extensive restoration but works well. If you are interested I could send you “Before and After” photographs and my account of the restoration. There is a lot of info out there but sometimes a little obscure to find. 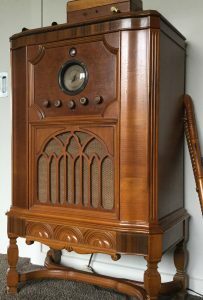 Always looking for interesting articles to help preserve some of the past radio events. The closing down of the private stations by the Government at that time is a subject all on it’s own. 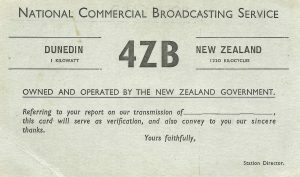 Broadcasting in New Zealand in those early days was very political.